Corn is at the height of it's season, here in Utah, and so I'm always on the lookout for new and tasty ways to prepare it. This summer pasta dish, based on a recipe by Melissa Clark, features corn in a surprisingly tasty way. The corn flavor, which takes center stage, is kicked up by green onions and basil. 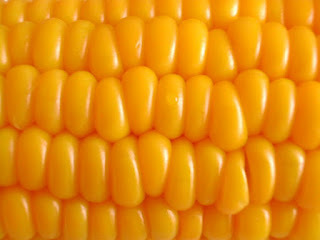 Off season, I would use frozen corn, because it's what I usually have on hand, but it would be even better with fresh corn, cut from the cob. 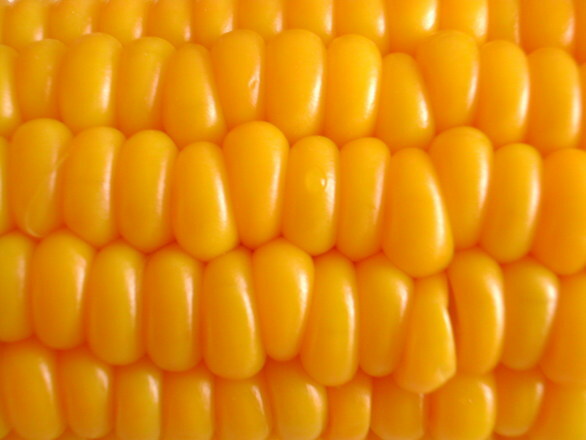 If you do use frozen corn, thaw and drain it, first. I don't normally keep fresh basil hand, so I used dried. If you have it, though, use 1/3 cup and toss it in at the end, omitting the dried basil and parsley. This sauce cooks quickly, so you will be able to make it at the same time you're cooking the pasta. Just start on the sauce after you set the water to boil, keeping an eye on the pot so you know when it's ready to add the pasta. Takes 30 minutes to make. Bring 4 quarts of water to a boil in a large pot. Add 1 Tbl salt and the pasta. Cook until just 1 minutes shy of al dente, according to the package directions. Drain, reserving 1 cup of pasta water. In the meantime, Heat the oil in a large sauté pan over medium heat, until shimmering. Add the scallion whites and a pinch of salt. Cook until soft, about 3 minutes. Stir in 1/2 cup of water, 1/4 tsp salt and 1/4 tsp pepper, and 1 3/4 cups of corn, reserving the remaining 1/4 cup. Simmer until the corn is heated through and almost tender, about 3 minutes. Remove from the heat and let cool, slightly. Puree the mixture in a blender, adding more water as needed to form a thick, but still pourable, sauce. In the same skillet, add the butter and melt over medium-high heat. Add the reserved 1/4 cup of corn, along with the dried basil and red pepper flakes, if using. Cook until the corn is tender, about 2 minutes. Don't stir it more than once. Letting the corn, and the butter, brown will make it all the more flavorful, just don't let it burn. Add the corn puree and heat through for about 30 seconds, just to combine the flavors. Once the pasta is cooked and drained, returning the pasta to the same pot it was cooked in, if needed, add the sauce to the pasta along with 1/4 cup of the reserved cooking water. Toss to coat and cook over medium heat for 1 minute more. Add more of the reserved water as needed if the mixture seems too thick. Off the heat, stir in the parsley and lemon juice. Add additional salt and black pepper, to taste. 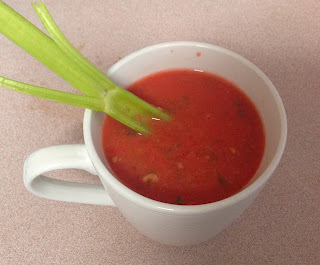 Garnish with grated Parmesan cheese, remaining sliced green onion, and a drizzle of olive oil, if using. Hamburgers are one of my favorite foods. Melt some cheese over it and I'd fall in love with you. (No, my wife didn't do that when we were courting. More's the pity.) But when two of your kids are vegetarians, more or less, you need to think about expanding the range of ingredients beyond just good ground beef. In fact, you've got to find some way to keep that rich meaty, charred, flavor without using meat. There are plenty of high-sodium, low-flavor, variants available at the grocery store these days. I'm not a huge fan of processed cardboard, but if that's your thing, go right a head and spend more money on them that you would on ground beef. Which is saying something, these days. I've found several recipes for veggie burgers online, and black beans seem to stand out as a favored ingredient for many of them. Oh, there are others, for sure, but black bean burgers seemed like an interesting choice. That and the ingredients are all pretty common to my pantry. 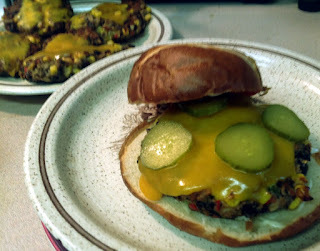 This recipe is my take on a black bean burger recipe from America's Test Kitchen. I modified a few of the ingredients, and their ratios, to better fit my pantry, and my taste. I use rolled oats in this recipe because they're easy, and I like the added flavor. Bread crumbs, or any type, will do just fine, though. Cilantro can be substituted for the parsley, if desired. Takes 35 minutes to make. Place 2 ½ cups of beans in a large bowl, setting aside the rest for later. Mash them with a potato masher until mostly smooth. In a separate bowl, whisk together the eggs, olive oil, cumin, salt, and cayenne, if using. Add the egg mixture, the remaining beans, oats, bell pepper, parsley, and green onion to the mashed beans and stir until just combined. Let stand for 5 minutes so the oats can absorb some of the liquid. Divide the mixture into 6 equal portions. Pack, lightly, into 1-inch-thick patties. These patties can be delicate, so take care when handling them. Heat 2 Tbl oil in a 12-inch non-stick skillet over medium heat until shimmering. Working with three patties at a time, carefully lay them into the skillet and cook until well browned on both sides, about 5 minutes per side. If you want to turn these into cheeseburgers, which I often do, drop a slice of cheese on top during the last 2 to 3 minutes of cooking. Transfer cooked burgers to a plate and tent loosely with aluminum foil, repeat with the remaining three patties. Serve on hamburger buns with your favorite burger toppings. To change things up a little, substitute 1 Tbl minced chipotle chiles (canned in adobe sauce) for the cayenne, reduce the red pepper to ¼ cup, and add ¼ cup of fresh or frozen corn, thawed and patted dry, to the bean mixture. I've tried it both ways and like them both, equally. 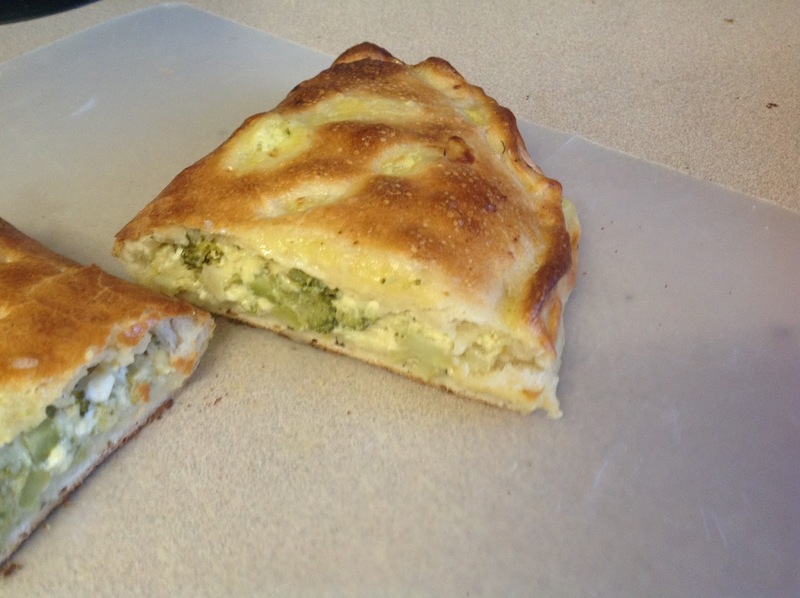 A great calzone, with a satisfyingly crisp and chewy crust, with plenty of flavorful fillings, is a treat worth the quest. The trouble is, most calzones I've found turn out with a soggy filling and have a crust more akin to bad bread than pizza dough. Not so with this recipe. Even better, this one gets you eating your vegetables in a way that is so tasty you won't mind. The cheese inside doesn't hurt, either. This recipe does require some work and time, but not as much as you might think. While I braise fresh broccoli, you could substitute frozen, if you want to skip cooking the broccoli. It won't be as flavorful, but it might say you a little time and effort. Just make sure to thaw, drain and chop it, first. In this case, add the garlic, oregano and red pepper flakes along with the cheese. My wife and kids like cheddar cheese, and so that's what I used, making this very American. For a more authentic Italian-style, use 1 1/2 cups of mozzarella and a 1/2 cup of feta, instead, replacing the cottage cheese with ricotta cheese. The cooked broccoli makes a great side dish unto itself, if you're so inclined. Heat cooking oil in a skillet over medium-high heat until just smoking. Add broccoli and a pinch of salt. Cook, without stirring, until the broccoli begins to brown, about 2 minutes. Add the water, cover, and cook until broccoli is bright green, but still crisp, about 2 minutes more. Uncover and cook until the water has evaporated and the broccoli is crisp-tender, stirring occasionally, about 2 more minutes. Push the broccoli to the sides of the pan to clear a space in the center. Add the garlic, oregano, and red pepper flakes. Cook until fragrant, about 30 seconds, and stir into the broccoli. Season with salt and pepper to taste and transfer to a serving plate, to cool a bit. Place an oven rack in the lower-middle position and heat the oven to 450 degrees. Cut two pieces of parchment paper into 9-inch squares. These will be used to make rolling and moving the calzones, easier. In a large bowl, stir the broccoli mixture, cottage cheese, and cheddar cheese together. Divide the dough in half. Working with one half of the dough at a time, transfer the dough to a piece of parchment and roll into a 9-inch round. Spread the broccoli-cheese mixture evenly over one half of the dough, leaving a 1-inch border. Fold the other half over the filling, leaving a 1/2-inch border of the bottom half uncovered. Brush edge with egg wash. Press the edges of the dough together, pressing out any air. Fold the bottom dough edge over the top, and press and crimp to make a pretty seal. Using a sharp knife, cut 5 steam vents, about 1 1/2-inch long across the top layer of dough, starting at the folded edge and cutting toward the crimped edge. Brush the tops with more of the egg wash. Using the parchment paper, transfer the calzone, along with the paper, onto a rimmed baking sheet. Repeat with the remaining dough half. Bake until golden brown, about 15 minutes or so, rotating the baking sheet halfway through baking. Transfer the calzones to a wire rack to cool for about 5 minutes, before cutting each in half, for serving.